Production planning software makes production planning and scheduling easy and helps your business to stay on top of production operations. 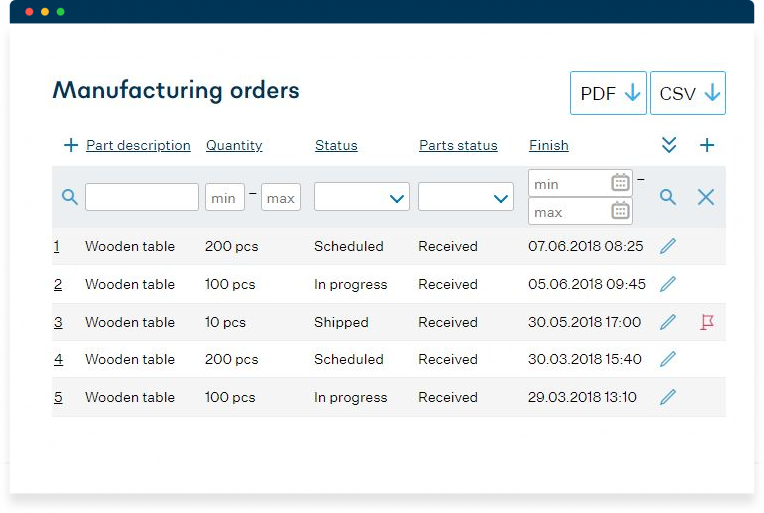 MO creation may be done in three ways: by sales in CRM, by production manager in Production Planning or semi-automatically when a critical stock level is met. Quick pre-production estimating – just enter the quantity of products needed to check the estimated cost and lead times. 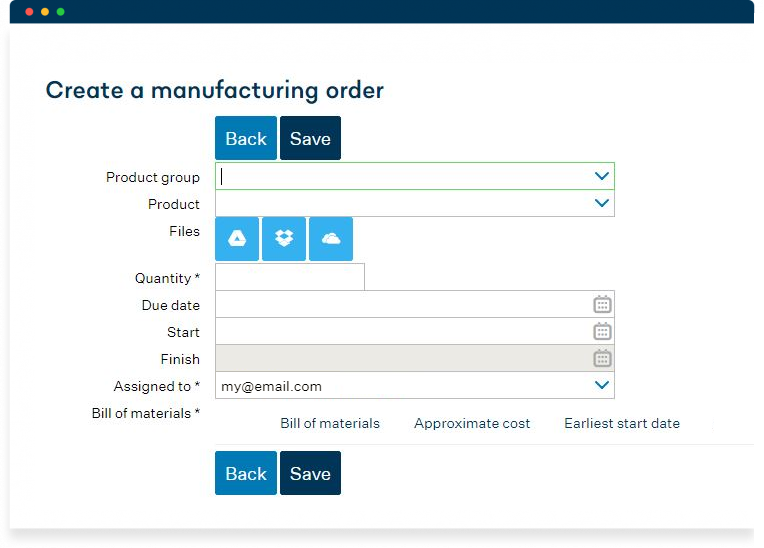 Once the MO is created, instantly book the materials on stock and automatically create purchase orders (POs) for procured items. Having your BOMs, stock and purchase terms managed in the same system allows you to accurately plan production before materials arrive. Having each new MO associated with a particular routing lets MRPeasy know what work operations it has to pass. Having all your workstation schedules managed in one place allows automatic checking for available time-slots and does the scheduling for you. Let the shop-floor team access their tasks online and let them report via computer, tablet or smartphone. 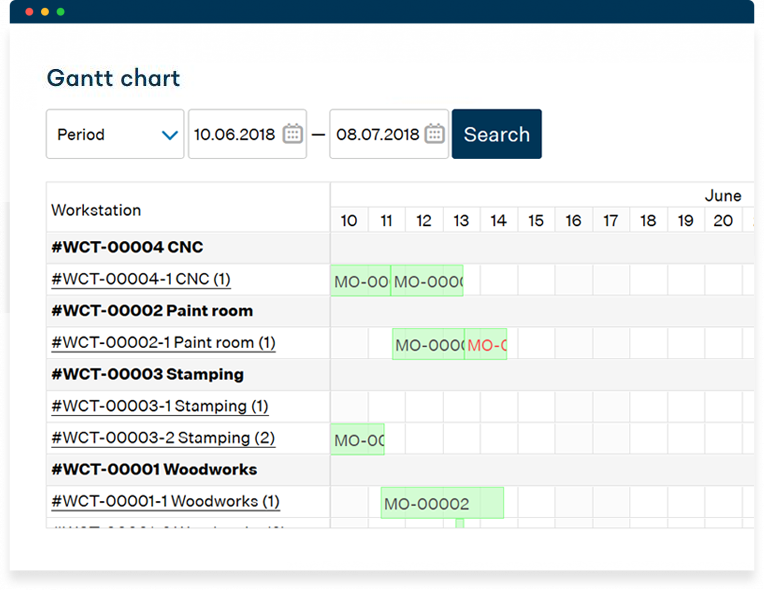 Follow the production schedule on visual calendars, or a Gantt chart and use simple drag-and-drop for rescheduling. Follow all your manufacturing orders and workstation schedules in the master production schedule. Analyze the statistics of work operations in Human Resources. Follow color-coded warnings when materials, operations or work orders are late, and take necessary action. Use one integrated tool for Sales, Production Planning, Stock Control, Purchasing and Shop Floor Reporting, and enable seamless collaboration across your team. MRPeasy is simple yet powerful production planning software that helps small manufacturers organize production. Just sign up to test MRPeasy, select the features plan that meets your requirements and access additional functionality as you grow your business.